US PRESIDENT BARACK Obama has praised an Irish woman who emigrated to the United States as he spoke about immigration reform. Speaking in his weekly address from the White House, Obama used the story of the woman, named as Ann Dermody, as an example to other emigrants as part of Immigrant Heritage Month in the US. Obama said she had “worked hard, played by the rules” and written to him about how she felt about becoming a US citizen. Dermody became a US citizen in March of this year having emigrated legally from Ireland. The US president used her story as an example of the type of person who would benefit from his proposed immigration reforms, which he is trying to introduce before his term as president ends. “I want us to remember people like Ann Dermody from Alexandria, Virginia,” Obama said. “She’s originally from Ireland and has lived in America legally for years. She worked hard, played by the rules and dreamed of becoming a citizen. “In March, her dream came true. And before taking the oath, she wrote me a letter. “The papers we receive… will not change our different accents [or] skin tones,” Ann said. “But for that day, at least, we’ll feel like we have arrived.”"
Obama praised Dermody ”and immigrants like her who have come to our shores seeking a better life – yes, you have arrived”. And by sharing our stories, and staying true to our heritage as a nation of immigrants, we can keep that dream alive for generations to come. It is only the second annual Immigrant Heritage Month in the US, which is meant to honour the accomplishments and role of immigrants in shaping US history and culture. Around 41 million people – around 13% of the total population of the US – are immigrants, according to the US Census Bureau’s 2013 American Community Study. Obama used his address to call for Republicans to vote in favour of the immigration legislation he is trying to pass which has been held up by bickering for two years, saying that he will “keep doing everything I can to make our immigration system more just and more fair”. 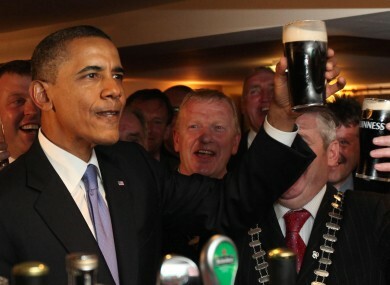 Email “Barack Obama praises Irish woman in speech about immigration ”. Feedback on “Barack Obama praises Irish woman in speech about immigration ”.